MATCHED SET Jubilee Edition 2019. 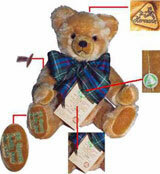 Hermann - Spielwaren GmbH, Coburg, Germany, Traditional Teddy Bears. Commemorating the Jubilee of Queen Victoria. 24th May 1819 to 22nd January 1901. For the 200th Birthday of Queen Victoria in 2019. Size: 35 cm, 13.75 inches tall. (24th August to 14th December 1861). Mohair teddy bears with traditional Excelsior filling. Hermann 13176 and 13177s et.